MILWAUKEE, WI, USA, December 13, 2018 /EINPresswire.com/ -- Why are so many people booking their vacations last minute? Is it all those great last-minute travel deals flooding our inboxes? Or today’s millennial travelers who are more comfortable with the technology that allows them to quickly and easily plan and book flights, hotels, rental cars and event tickets? The answer, according to research, is both. Nearly two billion vacations were taken last year, according to the U.S. Travel Association. While conventional wisdom would suggest the vast majority of these travelers plan and book their trips a month or more in advance, a new study from advertising agency Hoffman York (HY) reveals that nearly half are doing so at the last minute. HY surveyed 888 people who took at least one overnight trip over 50 miles away for leisure purposes in the last 12 months. Among travelers, 44 percent are planning and booking their leisure trips two weeks or less prior to their departure, with more than half agreeing that they can be swayed by last-minute deals, and 64 percent choosing to book their trips through online travel agencies. What else defines this new-age traveler and what makes them different than other travelers? Hoffman York, an agency that specializes in travel and tourism marketing, got to the bottom of this potential travel trend. HY defined last-minute traveler (LMT) as a person who books transportation, lodging and event tickets for an overnight leisure trip within 0-14 days of their vacation. How long are their trips? According to the research, the average last-minute traveler spends two to three days on their trip while one in five last-minute travelers are taking trips that are five days or longer. On the contrary, most non-LMTs stay 5 or more days (44 percent). Though the last-minute traveler is defined as someone who books within two weeks of departure, survey results show that most LMTs are actually booking within one week of their vacation. When planning and booking, 58 percent of transportation, 59 percent of lodging and 78 percent of event tickets are purchased within one week of the LMT’s departure. What’s more, 64 percent of flights and 30 percent of hotels are booked using an online travel agency (OTA) such as Expedia, Travelocity and Priceline. Non-LMT’s use an OTA for 30 percent of flights and 25 percent of hotel bookings. Non-LMTs are more likely to book directly through an airline (46 percent compared to 24 percent of LMTs) and directly through a hotel (42 percent compared to 30 percent of LMTs). 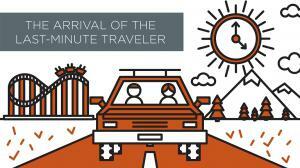 Primarily, last-minute travelers use their personal vehicle (74 percent of LMTs compared to 67 percent non-LMTs). The second most popular mode of transportation for LMTs is flying (36 percent)*. Significantly more non-LMTs are flying at 57 percent. On average, a last-minute traveler’s destination is 580 miles from their home. A non-last-minute traveler’s destination is nearly 900 miles. As for where they are going, 42 percent of last-minute travelers vacation in cities and 31 percent visit somewhere outdoors (lake, beach, state or national park). For non-LMTs, 38 percent visit a city and 27 percent visit the outdoors. During their trips, 58 percent of last-minute travelers visit friends or family, 21 percent seek an outdoor adventure, 22 visit a historic attraction and 16 percent attend an amusement park. As for non-LMTs 48 percent visit friends or family, 25 percent seek an outdoor adventure, 32 percent visit a historic attraction and 17 percent attend an amusement park.